Former CEO of Microsoft Steve Ballmer has reached an agreement to purchase the NBA Los Angeles Clippers for the price of $2 billion. Ballmer reached the agreement with Sterling Family Trust, said Shelly Sterling. It is still uncertain however if Donald Sterling, Shelly’s husband and the embattled owner of the club will agree to sell the team or fight to keep it. The attorney for Mr. Sterling said late on Thursday, prior to Ms. Sterling announcing the deal that her husband had not decided what his decision would be. Ms. Sterling ran a process to find a buyer for the club and said early on Friday that a binding contract had been signed for a sale of the team. She and her husband each own 50% of the team through the trust the two share, though he is recognized by the NBA as the team owner. She said she announced the sale of the team under the authority of being the sole trustee for the common trust owned by her and her husband. The bid Ballmer offered the Clippers is three times that of any franchise of the NBA. He released a statement saying he would be honored for his name to be given to the Board of Governors of the NBA for their approval. In order for the owners of the NBA to agree to the sale, they want Sterling to agree to a number of provisions: not to bring a lawsuit against the NBA, to pay a fine of $2.5 million the league levied against him and to accept a ban of a lifetime imposed by the NBA. 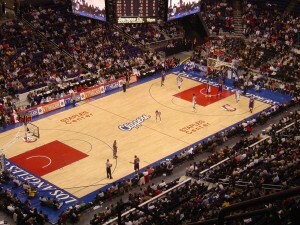 The trust received four bids for the Clippers. Included in the bids was one for $1.6 billion from David Geffen the entertainment mogul, who joined Oprah Winfrey, Guggenheim Partners, and the wife of the late co-founder of Apple Steve Jobs, Laurene Powell Jobs. Another bid of $1.2 billion was received from billionaires Bruce Karsh and Antony Ressler, who were in a group that included Grant Hill a former star player in the NBA.